Nozzles underfoot throw water jet reactive power which is 90% of the power water jet. It allows you to move from the slope of the platform Flaybord. A nozzle on the hands are used to provide stabilization as ski poles. 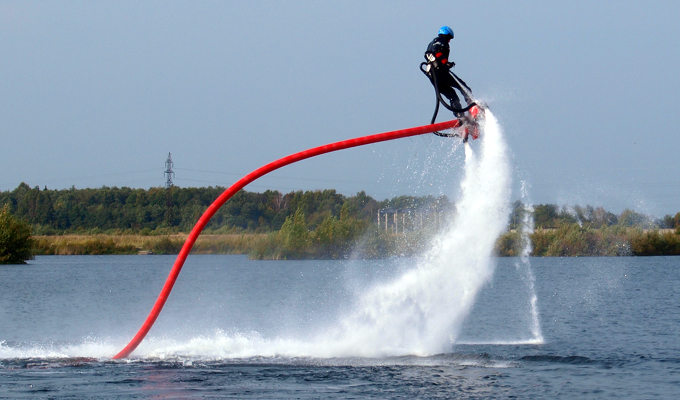 As you have seen, it is a mixture of passion Flaybord jet ski, ski, wakeboard and acrobatic jumps. Learning Flaybord is very intuitive. It's like learning to walk, ride a bike more, water-skiing or swimming. It is necessary to catch the balance, and you will become a flying man, or a man - a dolphin !!! Education (depending on the physical training person) lasts from 2 to 20 minutes with an instructor, and from 20 minutes to 1 hour without. Then you will be able to take off over the water and enjoy Flaybord for a few hours! The "best price" guarantee that you will always find the cheapest online prices for our products.